Is your old gate keeps getting stuck? Do you not have one at all? Then it's definitely time to have a new driveway gate installed and give your property the added security and appeal that it so rightly deserves. Given your surrounding conditions, you may find that not all gates are suitable for your needs. If your driveway is very short, or if it starts very close to a busy street or a main road, then a swing gate may not be for you. This type of system requires space to move inwards or outwards, and if there isn't enough of that, it may be inconvenient to use it on a daily basis. A sliding gate will be an excellent alternative. It moves laterally, so all it needs is some space alongside your driveway. Of course, if that's an issue than the former option might be the better choice. What your gate will be made of is another key consideration that needs to be taken. Wood holds a classic sort of appeal, but also requires regular repairs and maintenance. Wrought iron gates are known for their luxurious ornate appeal, as well as their durability, however, given that these are bars and not entire slabs, privacy is an issue. Also, without regular repainting, you may find it developing rust-colored blooms over time. Steel is great in terms of security and privacy; entire doors can be made rather than bars with gaps. However, that also means that it is heavier than other types. What does that mean for you? That your electric opener will need to withstand the extra load. Whether you're looking to replace your old automatic gate system or you want to install a new one for a brand new piece of property, our experts can help. 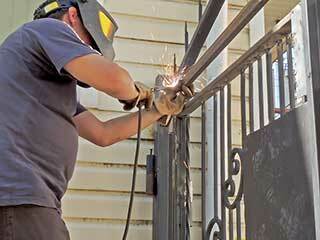 Gate Repair Malibu will provide all the information you need to find the perfect new system for your needs, and our technicians will carry out the installation of your new system with speed, efficiency, and safety. Give us a call today and ask us everything you want to know.